1. How do I decide what type of career goals are right for me? 2. What field of study should I pursue? 3. My career goals are different from what my family thinks they should be. • Access where the student is and where they are starting from in the career planning process. • Explore the student’s career interests, values, aptitudes, skills and lifestyle preferences in relation to possible careers. Raza Abbas is a dual graduate in Business Administration and Communication from The University of Arizona, United States. Raza is also a graduate from the Arizona Blue Chip Program, (only 04 year personal leadership program in the US) and has earned a certification in Organizational Development from Arizona Collegiate Institute for Leadership. Last but not the least he has acquired training from Career Services Department at The University of Arizona.  He feels grateful to possess more than a decade of global experience in Career Development, Leadership Development, Executive Coaching, etc.  He has coached master trainers and trained thousand’s of employees and students.  He introduced professional career counseling in Pakistan for the Education & Literacy Department, Government of Sind, BBSYDP Program.  He also introduced career development in Pakistan for the Sports & Youth Affairs Department, Government of Sind, INSYPRE Program. 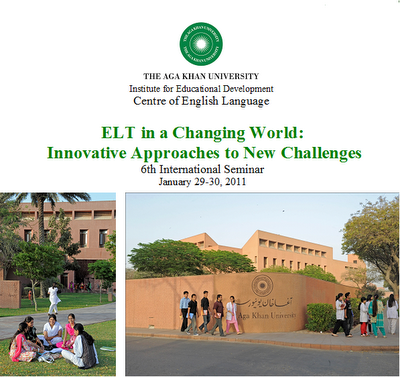 • The session is open to all students and teachers of Pakistan. • Each school will be required to send the students from Classes IX, X, XI & XII. • Each group of students must be accompanied by one or more teachers from the school. The Career Guidance session will be held at The Institute for Educational Development (AKU-IED) on Saturday February 12, 2011 starting at 9:00 am sharp.  Participants will be required to arrive latest by 8:30 am.  Attendance and related formalities will be completed by 8:55 am to ensure that the session starts on time at 9:00 am.  The event will end at about 1:30pm.  Schools are requested to send in the duly completed registration form (attached) latest by February 8, 2011.  The registration form must be completed in all respects and the names of the students and accompanying teachers must be clearly spelled and presented in CAPITAL letters.  The forms must be submitted at PTAN Office, IED.  Institutional members are allowed to send only 1 teacher. For additional teachers Rs. 100/- will be charged per teacher. We urge you to take part in this novel event and contribute in its success. Please feel free to contact the undersigned or the PTAN Office if you have any query or require clarifications. Facilitators: Dr. Huma Ghaffar, Chairperson, ASSET & Ms. Bilquis Munaf, Vice Chairperson, ASSET. Note: To ensure quality only a group of 30 will be accepted on first come first serve basis. Remember punctuality is the key to success. Kindly confirm your participation latest by January 26, 2011 at registration@ptan.org or (36347611-14 or 36826991-94 Ext. 3204 / 3205), as this will facilitate us in organising the workshop effectively. Kindly confirm your participation latest by January 26, 2011 at registration@ptan.org or (36826991-4/ 36347611-4 Ext. 3203 / 3205), as this will facilitate us in organising the workshop effectively. Due to some unavoidable circumstances the topic “Behaviour Modification of Children” of the upcoming EYLA workshop to be held on January 22, 2011 has been changed. The new topic will now be “Developing Thinking Skills in Early Years”. Note: Topic will be covered in three sessions so only those who attend all of these workshops will get the certificate. New entries for the second and third session will not be allowed. Since number of seats is limited, therefore confirmations will be necessary and based on first come first basis. Interested members are requested to kindly confirm their participation latest by January 25, 2011 at registration@ptan.org or PTAN Office (36826911-4/36347611-4 Ext. 3203 / 3205) as this will facilitate us in organising the workshop effectively. Hywel Coleman - Leeds University, U.K.
On behalf of PAIE Executive Committee, we would like to invite you for the PAIE workshop to be held on Saturday, January 15, 2011. In view of limited seats available, prior registration for this workshop is mandatory. Kindly confirm your participation latest by January 13, 2011 at registration@ptan.org or (36826991-94/36347611-14 Ext. 3203/3205), as this will facilitate us in organising the workshop effectively. We look forward to your participation! On behalf of MAP Executive Committee, we would like to invite you for the MAP workshop to be held on Saturday, January 15, 2011. We would like to iterate that in order to provide quality professional development to all valued members and to run this association effectively we need your full support and punctuality. Since seats for the session are limited, interested members are requested to kindly confirm their participation latest by January 13, 2011 at registration@ptan.org or (36826991-94/36347611-14 Ext. 3203 / 3205), as this will facilitate us in organising the workshop effectively.